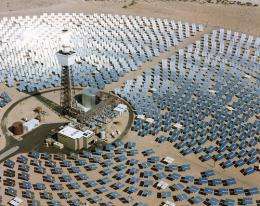 (PhysOrg.com) -- A Californian company, SolarReserve, is developing a solar power system that can store seven hours' worth of solar energy by focusing mirrors onto millions of gallons of molten salt, allowing the plant to provide electricity 24 hours a day. The company has applied to regulators in California for permission to build the 150-megawatt Rice Solar Energy Project solar farm near the abandoned town of Rice in San Bernadino County, California. The solar energy is stored using a massive circular array of up to 17,500 mirrors (heliostats), each measuring 24 by 28 feet and attached to a 12-foot pedestal. The heliostat field encircles a concrete Solar Power Tower 538 feet high, with a 100-foot high receiver on top, which holds 4.4 million gallons of molten salt. When the heliostats focus the sunlight onto the receiver the salt is heated to over 1,000 degrees Fahrenheit. 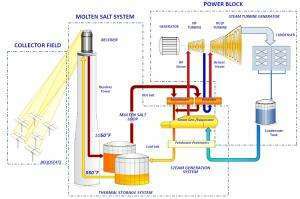 When it is needed, such as at night or at peak times, the heat is released by passing the molten salt through a steam generator that drives a turbine to produce electricity. The cooled salt is then recirculated to the receiver for re-heating. The project brings the dream of a solar system that generates electricity in the dark to a reality, and avoids the need to use fossil fuel plants for backup electricity generation. A diagram of the SolarReserve process. The salt used is a mixture of sodium and potassium nitrate (the same as that used in fertilizers), which is cheap, reliable, and environmentally friendly. It will be mixed on site with no additives. Apart from a few unique components such as the high heat flux hardware in the tower, the system uses existing technologies such as turbines and steam generators. This means SolarReserve can produce electricity at prices equivalent to or below fossil fuel burning plants. The system was proven over a four-year period in the 1990s at the 10-megawatt Solar Two demonstration project near Barstow in California. The solar salt technology was originally developed by Rocketdyne, a subsidiary of United Technologies, and many of SolarReserve's scientists are former employees of Rocketdyne. United Technologies has licensed the system to SolarReserve and guarantees its performance. Chief Executive at SolarReserve, Kevin Smith, said other solar systems also use salt as storage, but they use synthetic oil in the steam generation. Using salt for both means the system is more efficient, since it can produce steam at higher temperatures and can harvest three times as much energy for the same amount of salt. The Rice Solar Energy Project solar farm will be constructed on now privately-owned land that used to belong to a World War II Army air base to the east of Palm Springs. The system will be air cooled, thus avoiding criticisms about water use, but its height, at 653 feet (with a maintenance crane on top), could spark other criticisms, as did a previously proposed SolarReserve project in Nevada. SolarReserve expects the solar farm to go online late in 2013, and is in negotiations with utility companies in California to buy the generated electricity. Video: official trailer by SolarReserve. I would have guessed that a salt at those temperatures would be highly corrosive. Good job getting that under control. Seems that finally the last hurdles for solar power plants are being adressed! I was just curious, how much more efficient are these than the power plants we use today? Do they take up the same amount of room, etc. Either way this is amazing! Can this ever become more efficient without adding extra mirrors? This looks like a plant design from Spain which was dismantled and sold to somewhere in the US. Spain sold it because it was not cost-effective. That's saying something, since Spain has gone hog-wild for green energy. Spain has found that their expensive, ineffective green power program kills 2.1 jobs for each green job created. And Spain in now in a depression, with 18% unemployment. When (if) these types of plants are cost-effective, industry will build them on their own dime. We should be investing in research, not high-cost power production. It all boils down to $/W ratio. This can be attenuated by the carbon credits to take into account the green factor. This looks like it should have a low running cost after the initial capital intensive installation. How many years before it breaks even? Operating at 1000F, it should be as efficient as any coal/gas fired plant, about 40%. It will take up more space than a coal or nuclear plant, but less space than a photovoltaic system. The pdf about Solar Two is worth reading. Yabut, what about the desert mice that will be displaced? Anyone noticed the condensation-evaporation step? Isn't this lost energy? That article is over 10 years old. it mentions 1999 in the future tense. Is this a testament to nothing happening on this front in 10 years? or is there nothing new to report? or is this just a blast from the past to show how we aren't making progress? Or, it could simply be that we already knew how to do this, but couldn't get anyone to invest in it until politics and/or economics began to play a vital enough role. Solar Two was a nice little test project that proved this can be done. It's good to see someone finally taking this up and going with it - even if this is 10 years late. We need a dozen more of these being built (or more). Spain has found that their expensive, ineffective green power program kills 2.1 jobs for each green job created. This is another lie that Spain has completely proved wrong. Spain's RE program like most others is doing very well. A few months ago their whole power needs were met just from wind. And they didn't lose jobs, but gained many thousands. They now build a lot of wind generators we use here though many of the parts are made here too to avoid shipping, etc costs. I don't know of the solar plant he talks of but that is probably a lie too since the other parts are. Why do these Luddites have to spread lies? I guess it's their arguments are so weak it's their only chance. * The Solar 2 project is 10 years old. Its success is the reason they're ready to move on from 10 to 200 MW. * Green power isn't just killing jobs in Spain, but also in Germany, Denmark, Japan and the US which is installing windpower like mad. You want to be a coal or uranium miner, I'm sure there's a nice filthy, dangerous, health-wrecking job someplace at a mine that will give you a big smile, handshake, helmet and gas mask so you can ride a mile down the elevator and choke. Enjoy! The Spain powerplant of similar type is Andasol with Andasol 2 and 3 already under construction. Green power is not killing jobs in Germany. We are running out of coal here and the mines left are being subsidized by the state (they wouldn't be economcally viable otherwise). They need to be shut down anyhow. On the contrary: there are many new jobs being created in the alternative energy and other connected sectors. Given that with conventional power plants there are associated costs which are not factored into the W/$ figure (air pollution, waste, environmental destruction) it is high time we use all environmentally friendly alternatives where viable. What will doom this plant's efficiency are California unions. There are other solar power projects planned for the California desert but they've been hijacked by unions demanding all work be union. The unions have filed environmental impact lawsuits to block these projects if they aren't given all the work. There are already a number of pending projects blocked right now. If operators give in to the unions, they'll drop their lawsuits.